Without any resemblance to the creation (tashbeeh). Without denying the Attribute (ta’teel). Without explaining it away with metaphors (tahreef). Without saying “how” the Attribute is (takyeef). Without likening the Attribute to the creation (tamtheel). The great Imām of the Salaf, Ibn Khuzaymah (rahimahullah) has discussed this hadeeth stating the pronoun ‘His’ refers to Allah Himself. 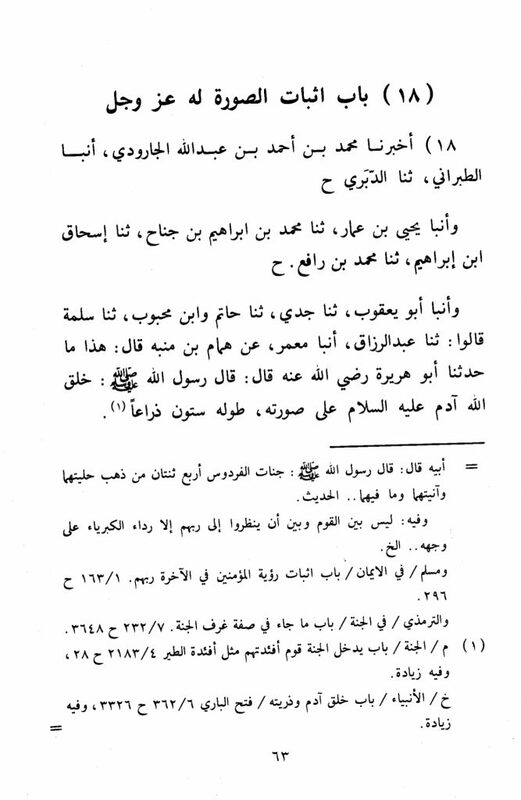 And this is supported by the wording, “If anyone of you [ends up] fighting with his brother, he should avoid his face for indeed Allah created Adam in His own image.” (Muslim, 2612). And there are other wordings that he narrates from the Prophet (salallāhu ‘alaihi wa sallam) such as, “If one of you strikes [his brother], avoid the face, and do not say: ‘May Allah disfigure your face,’ [your brother’s] face resembles your face — and indeed Allah created Ādam on His image (Sūrah).” Ahlus-Sunnah wal-Jamā’ah affirm for Allah what He has affirmed for Himself and whatever the Messenger (salallāhu ‘alaihi wa sallam) has affirmed for Him in a manner that befits His Majesty without denial (ta’teel), without saying “how” (takyeef), and without resemblance (tashbeeh) — alhamdulillāh. 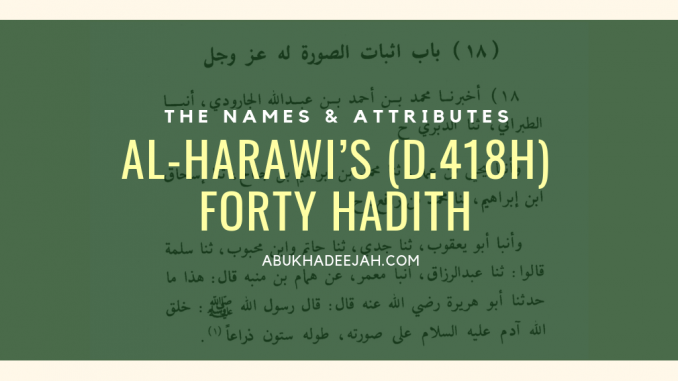 Read the rest of the series by going to ‘categories’ then ‘books’ and then ’40 Hadith Harawee’.